TDmonthly Magazine Products by JANLYNN CORP.
With this kit, kids can personalize their own skateboard. One of the only sports craft kits available on the market. With the DYO Real Skateboard Kit, children can decorate their own one-of-a-kind real skateboard. Personalizing their own skateboard will inspire a child's originality, and foster spirit and commitment. Launch date: 2012. Charmtastic is a jewelry line for young girls featuring bracelets and necklaces that can be personalized with clip-on charms. The charms are available in the following themes: Amazing Animals, Awesome Activities, Birth Stones, Bling, Incredible Icons, Tween Talk and Tween Treats. Offered at an affordable price, Charmtastic adheres to all safety standards. The Charmtastic 4-sided spinner offers a unique assortment of 80 charm styles and 6 bracelet styles. Janlynn also offers a 2-sided spinner. "The extensive charm options and affordable price points make Charmtastic highly collectible and accessible to young girls," Thomas J. Lonergan, executive vice president of the Janlynn Corporation, told TDmonthly. Launch date: February 2010. This designer clear In the Garden stamp set designed by Max & Lucy includes 12 flower and garden inspired stamps to add a touch of nature to card, paper and craft projects. Made from a non- yellowing clear silicone, Janlynn's Designer Clear stamps are easy to use. Simply peel the stamp from the protective backer and stick to a Designer Clear acrylic block, sold separately. This Designer Clear Pets stamp set designed by Max & Lucy includes 11 pet inspired stamps. Made from a non- yellowing clear silicone, Designer Clear stamps are easy to use. Simply peel the stamp from the protective backer and stick to a Designer Clear acrylic block, sold separately. The Designer Clear Butterflies & More stamp set designed by Tara Reed Designs includes 22 stamps to mix & match to create beautiful card, paper and craft projects. Made from a non-yellowing clear silicone, Designer Clear stamps are easy to use. Simply peel the stamp from the protective backer and stick to a Designer Clear acrylic block, sold separately. Sunset in bright, beautiful colors! A STRING ALONG Sensation designed by Roc Ahrensdorf. Quick, Safe and easy! Follow the pattern and string floss through holes on a pre- drilled board to create a colorful design. Kids will enjoy hours of fun, as well as provide them the opportunity to develop skills in crafting and dexterity. This Counted Cross Stitch Princess tiara will be a great first project for kids! Have fun with Janlynn's Kid Stitch™ line. - Frame included. Each kit contains 14 count 100% cotton Aida fabric, 6-strand cotton floss, stitching hoop, needle, graph, and instructions in English & French. Finished size 3" round (7,6 cm round). Disney Princess' "Dreams Are Blooming" Color your own pillowcase design from ©DISNEY. Kids enjoy this wonderfully illustrated pillowcase design full of everything you would want from the Princesses; castles, flowers, birds and of course Belle, Snow White, Cinderella and Aurora. Give your kids a reason to save! Enjoy one of life's crafting pleasures and create a "U-Paint-It!" Jumbo Piggy Bank for all of your kids coins. This jumbo piggy pottery bank is ready to decorate and display! Kit comes with everything you need to paint one bank. Design Your Own Sport Bobble Head Kits are real figurines that have not only a bobble head, but additional bobble features. Kits includes a multi bobble sports figurine and everything you need to personalize and decorate in your favorite sports team colors. Design Your Own Sport Activities are real sporting goods items that can be personalized and played with. Kits includes a sporting item and everything you need to decorate and use again and again. Whether it's a regulation size soccer ball or an authentic working skateboard, kids will enjoy adding their own designs and having a personalized item that they can play. — As of 1.06.2011 this product was listed as a bestseller in the Arts& Crafts section at Toysrus.com. Pros: Great for fans of sports or crafts; includes regularion size soccer ball. "Make it Cool" Friendship Party pack. 8 Weave Wheels inside. Kids love the simple lifting and turning motions that make bracelet weaving fun and easy to do! Make them, wear them, or give them to a friend! This High School Musical Iron on Transfer Kit features 1 large Iron on Transfer of your favorite HSM characters along with 3 small icons that can be used on your shirt or to coordinate additional accessories. The Kit also includes 1 Glitter paint pen to personalize your shirt with your name or favorite HSM slogan. Go Wildcats! Sassy and brave...she'll be the first to tell you "I'm no Princess." Paint the charming, tempermental Tinker Bell with this Paint by Number kit. Each kit contains preprinted textured art board, high quality acrylic paints, glitter paint, a #1 round paint brush and easy to follow instructions in English and French. Finished size: 9" x 12". Pirates PillowCase Art is ready for kids to color. This Skull & Tentacles pillowcase design is from ©DISNEY. All rights reserved. Each kit includes one permanent-inked, screen printed, polyester/ cotton pillowcase, 16 Non-toxic crayons and instructions. EASY AS 1-2-3! 1-Color printed design, 2-Add your own artistic touches, 3-Heat set you masterpiece! Adult supervision required for heat setting design. Available in 20 Disney Licensed Designs. It's a beautiful day for a swim on the reef with Nemo. Kids can paint the adventurous little clownfish with this Paint-by-Number kit. 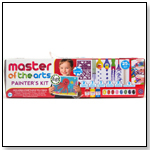 Each kit contains preprinted textured art board, high-quality acrylic paints, a No. 1 round paintbrush and easy-to-follow instructions in English and French. Finished size is 9" x 12". This kit includes a pillowcase screen-printed with outlined drawings and 16 non-toxic crayons. “Simple coloring with non-toxic crayons creates a creative keepsake that every child will cherish,” National Sales Manager Catherine Dyjak of Janlynn told TDmonthly. This kit includes a pillowcase with outlined drawings and 16 non-toxic crayons. “These all inclusive kits are fun and easy to do. There are not many more things a child takes more pride in than a project they can create themselves,” National Sales Manager Catherine Dyjak of Janlynn told TDmonthly. This kit includes one standard screen-printed pillowcase made of polyester and cotton, 16 soy-based non-toxic crayons and instructions.